Join the discussion on our forums! 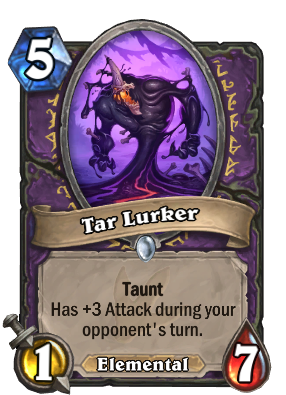 Come discuss Tar Lurker over in our dedicated Tar Lurker discussion topic. what's your opinion? what would be better - this costing 4 mana or with more health? Nice, but why is this a warlock card? What kind of warlock deck is gonna need this card especially? The smaller Tar elemental is neutral and the bigger one is Warrior, both makes sense, but a warlock has no use of this card. I guess it makes him stronger in arena? i play him in my wild renolock. hard to kill and buy me some times to find kazakus, reno etc. for standard control-ish warlock is dead not enough heal. do u realize that this is a 4 drop with a text?? 5 mana 4/7 taunts are conditional cards and you say this is a 4 mana drop? What? I think he means this is just a Buff over Mogu'shan Warden, which is a 4-drop. True but basically +2 attack because Blizzard has refused to make 5+ mana taunts that pass the vanilla test, except for the Druid of the Claw. This card won't get played, mark my words. Theres still Earthen Ring Farseer, Mistress of Mixtures, Armor from a Kaza-Potion, and potentially some healing from Kabal Courier and Kabal Chemist. It's hard to say what's viable and what isn't yet. Let's wait until the new expansion to make hard judgements on such flexible archetypes as reno decks. That said, of all the Kabal classes, Warlock had by far the most synergy with Reno Jackson himself. Knowing you had a heal in the works let you use Life Tap without worry, and enabled the use of otherwise too self-destructive cards like Felfire Potion. Without Reno, Renolock will suffer, and suffer in a huge way. Another card that has the Priest holding onto a Shadow Word: Pain cursing his opponent.